I love rock painting and doodling on rocks! I’m actually obsessed with it. If you follow me on Instagram you’ll see that I post pictures of my obsession quite often. When Faber-Castell USA asked if I wanted to try out some of their art supplies to see if they worked on rocks, I jumped at the chance. While this post is sponsored by Faber-Castell USA, all opinions and ideas are completely my own. 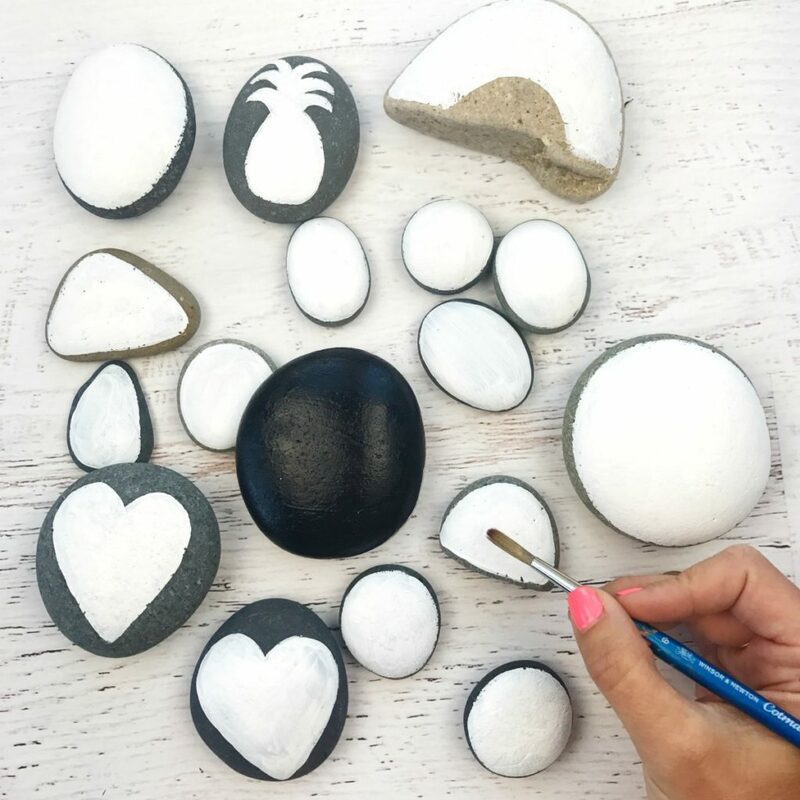 And I have to say, I’m really excited to have found some new ways to decorate and paint rocks. Affiliate links are included throughout the post for your convenience. There’s not much you have to do to prep your rocks. I simply hose off mine and let them dry. If you are having trouble finding smooth stones, check your local garden center for river rocks, but don’t get the kind with a glossy finish. For all of the rock painting and decorating techniques listed below, I started with an acrylic painted base. 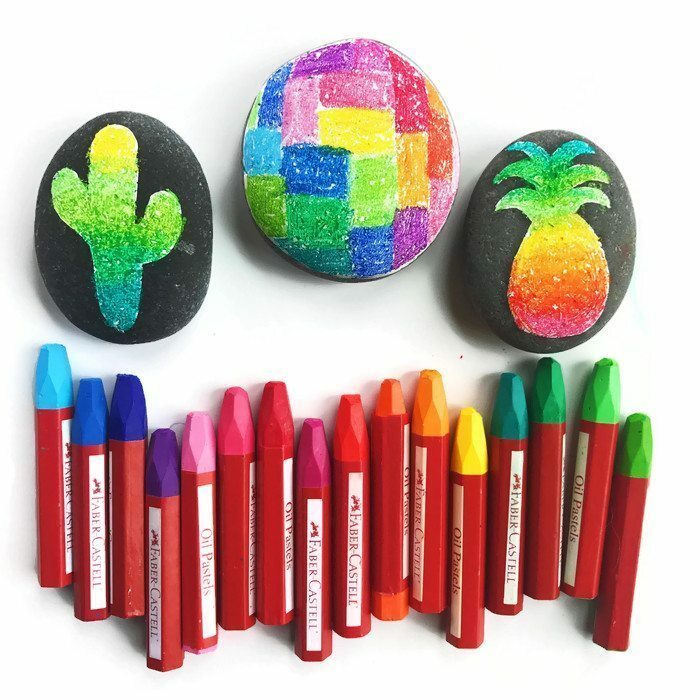 If you love bright, beautiful colors, these rocks using Faber-Castell Oil Pastels are for you! Faber-Castell Oil Pastels – The pack of 24 has such a great mix of colors, and I love that the colors come in various tones as well. Perfect for creating an ombré effect. Sealant – I always use this matte sealant on rocks because it still keeps the natural matte look of the rock. 1. 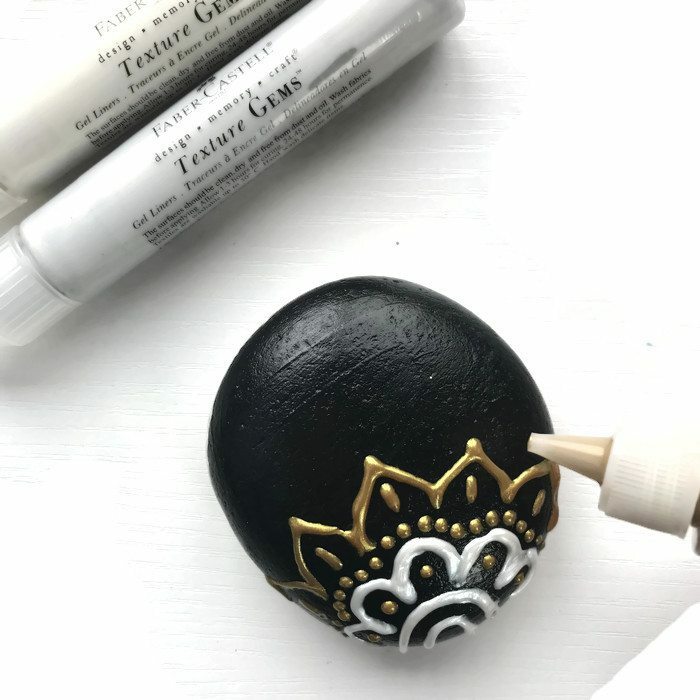 Start by painting your rock with white acrylic paint. You’ll want to add at least two layers of paint. Cover the entire rock or create a simple design. 2. Using your Faber-Castell oil pastels, start to color in the area you covered in white paint. For an ombré effect, begin with your lightest color and move towards the darkest. 3. To create a smoother look, add several layers of oil pastel. I only added two layers because I liked that the colors weren’t completely smooth. It gives the designs depth and texture. 4. 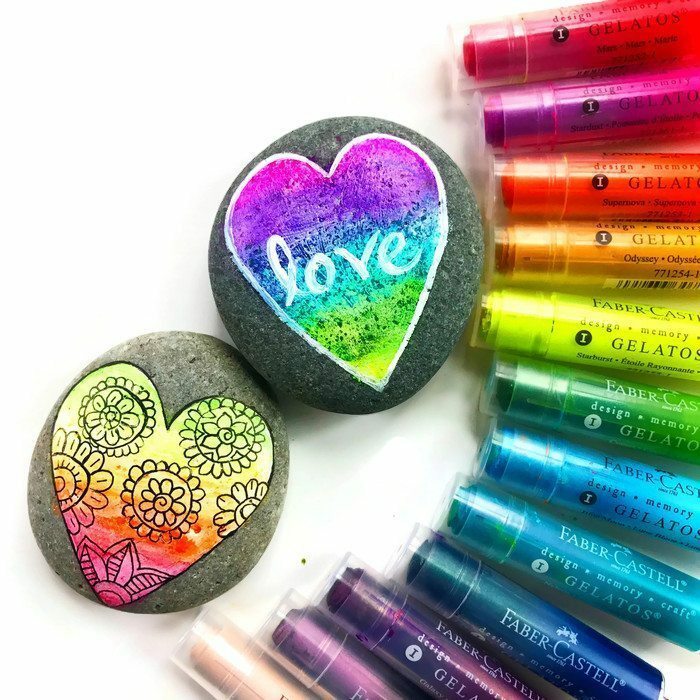 Once your design is complete you’ll need to seal the rock to keep the oil pastels from smearing and rubbing off. Using this matte sealant, I covered the rock with two layers, letting the first layer dry before adding a second. For most rocks you only need one layer of sealant but, due to the wet nature of oil pastels, more than one layer is required. 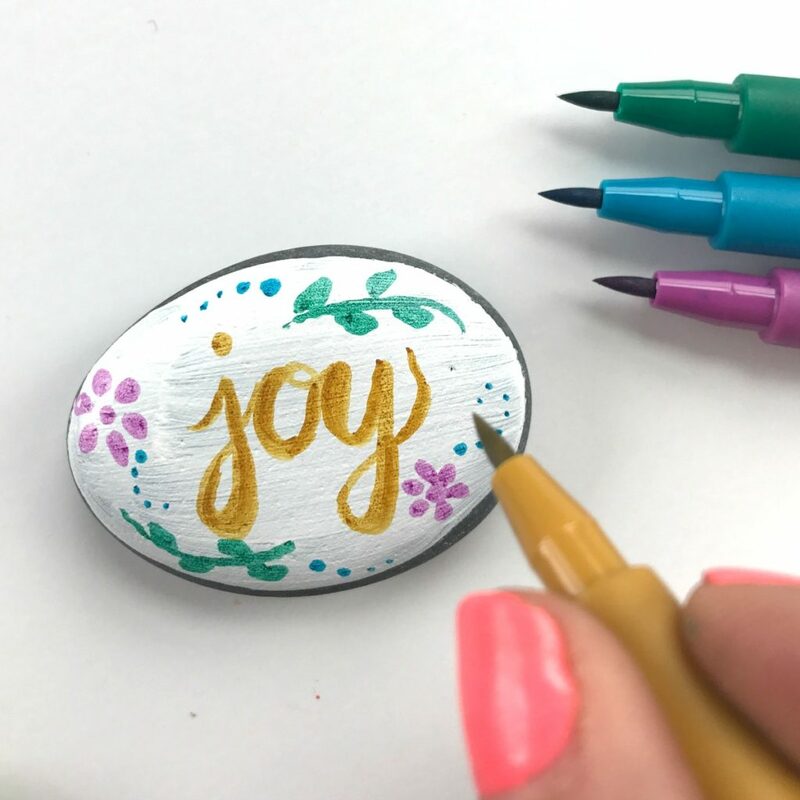 These rocks that were covered using Faber-Castell Design Memory Craft Gelatos Colors Iridescents have a beautiful and soft watercolor-like feel, perfect for creating a beautiful base for doodles or words. Faber-Castell Design Memory Craft Gelatos Colors Iridescents – These are acid-free pigment sticks that glide on creamy vibrant color. 2. 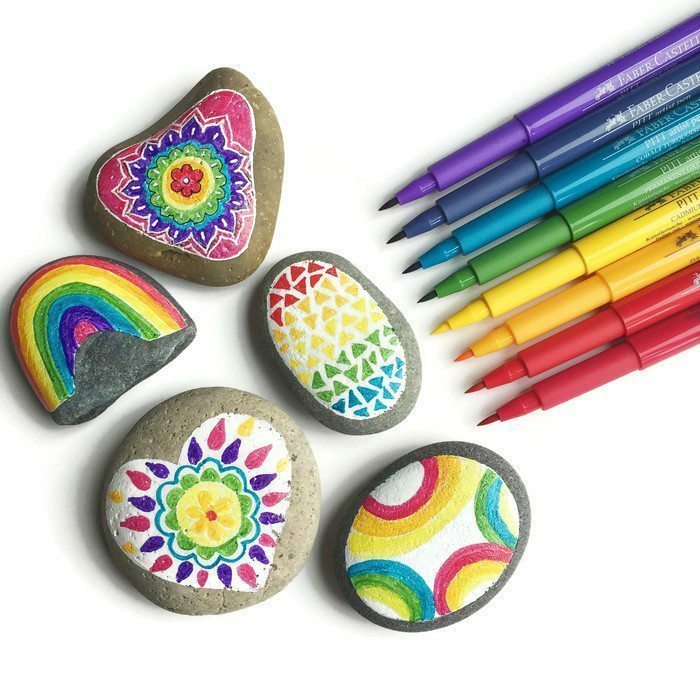 Color in the white acrylic paint area on your rocks using the Faber-Castell Gelatos sticks. 3. To create a watercolor effect, dip a paintbrush in water, and lightly brush over the area you just covered with the Gelatos. 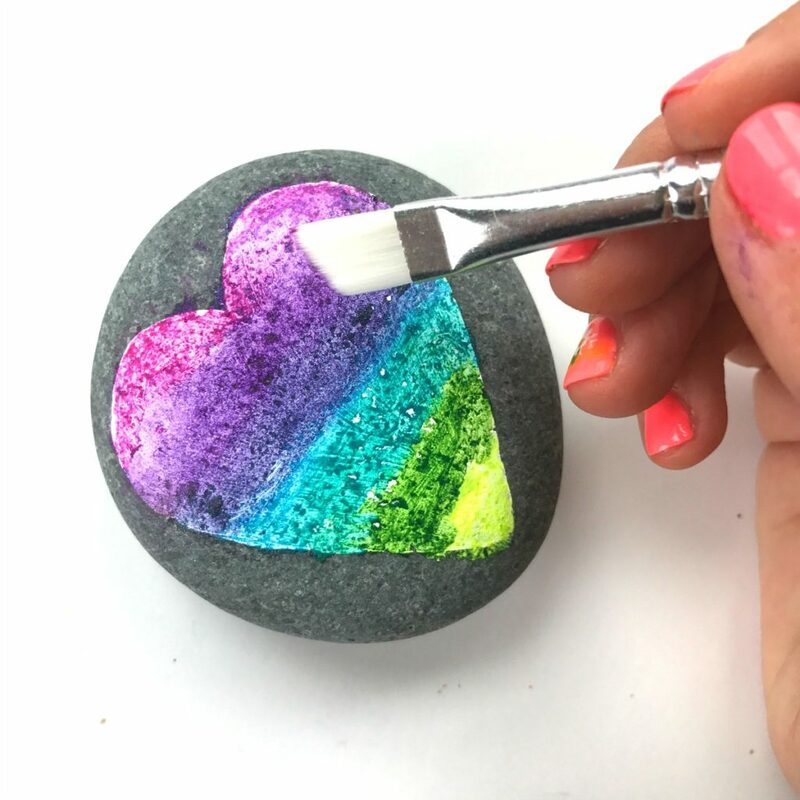 Or for an even smoother look, apply your Gelatos to a separate piece of paper, dip you brush in water, pick up the Gelatos pigment from the paper and apply directly to you rock. 4. Once dry, apply doodles or words using a black Faber-Castell Pitt Artist pen or acrylic paint. 5. Seal your designs with a single coat of spray sealant. 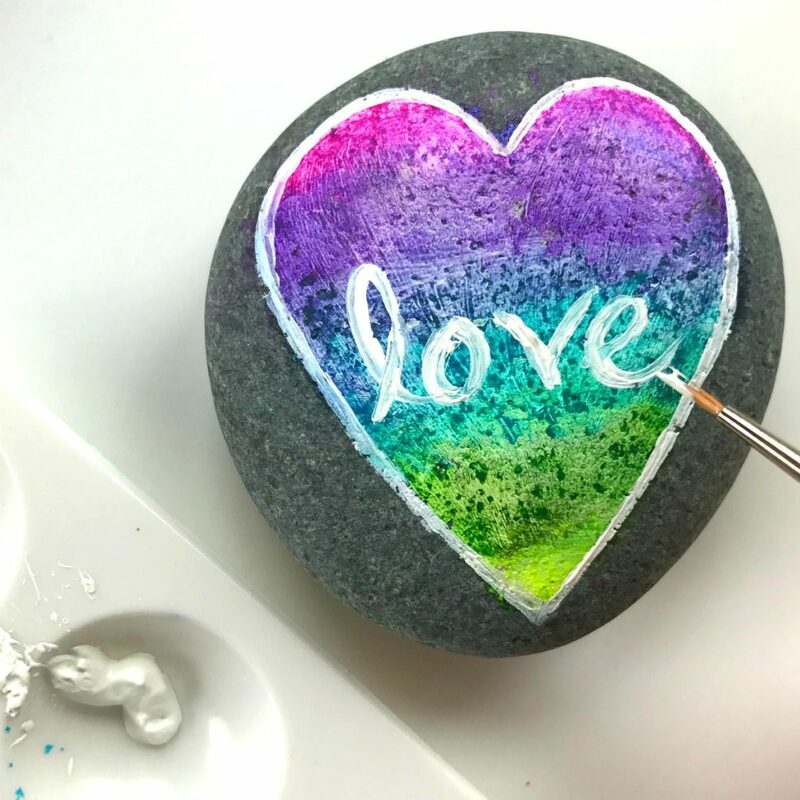 If you want a simple yet beautiful way to decorate rocks, this technique is for you. 1. Cover the entire rock with at least two layers of white acrylic paint. 2. 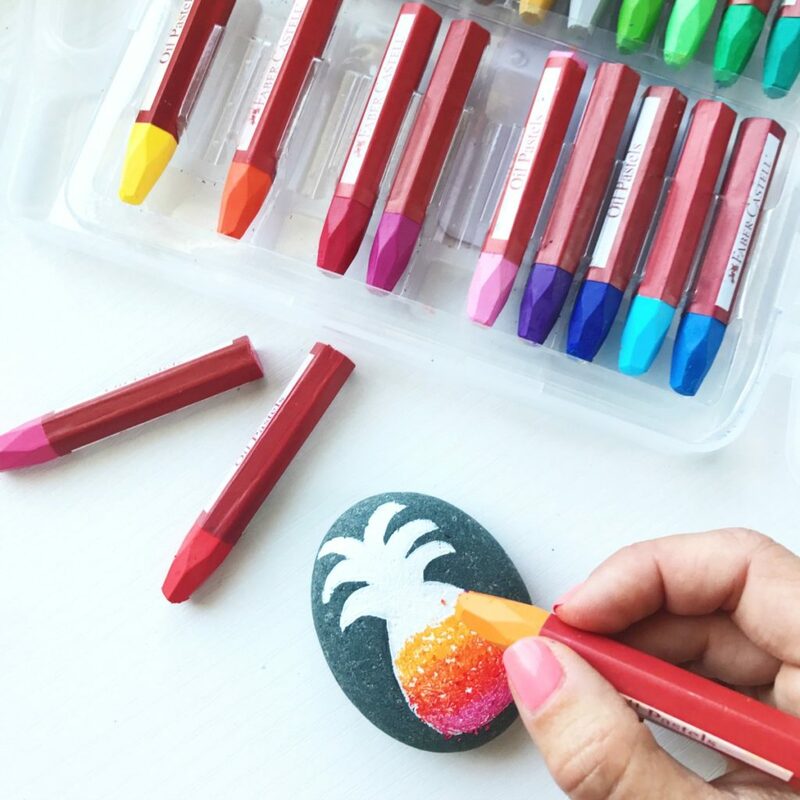 Create your doodles using the Faber-Castell Pitt Artist Pens. I loved both the vibrant colors of the basic pack, and the soft beautiful tones of the jewel pack. 3. Spray your finished designs with a single layer of sealant. 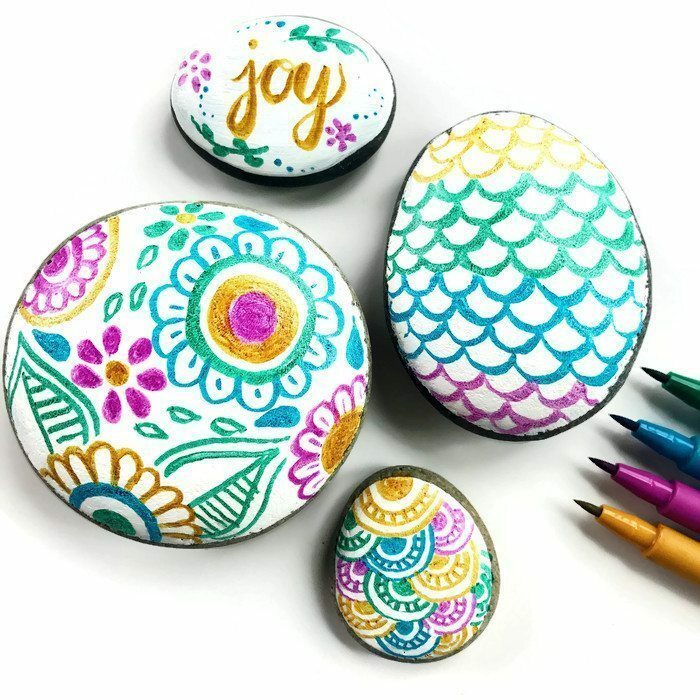 It’s easy to add metallic dimension texture to any of the painted rock design techniques listed above using Faber-Castell Design Memory Craft Texture Gems. I couldn’t believe how beautifully these gel liners worked on rocks. And it was so fun to have an art supply that added dimension to what is typically a flat surface. 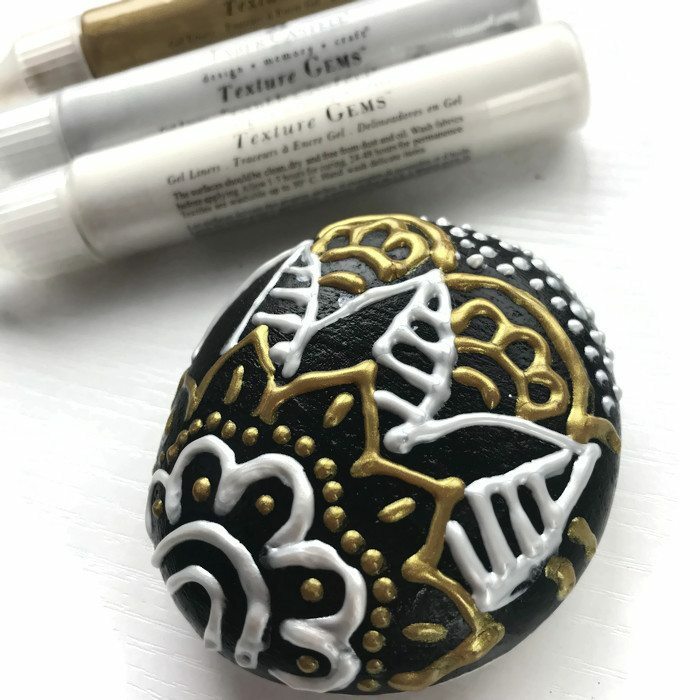 I added my texture gems to a rock I simply covered with black acrylic paint, but you could add Texture Gems to virtually any design. 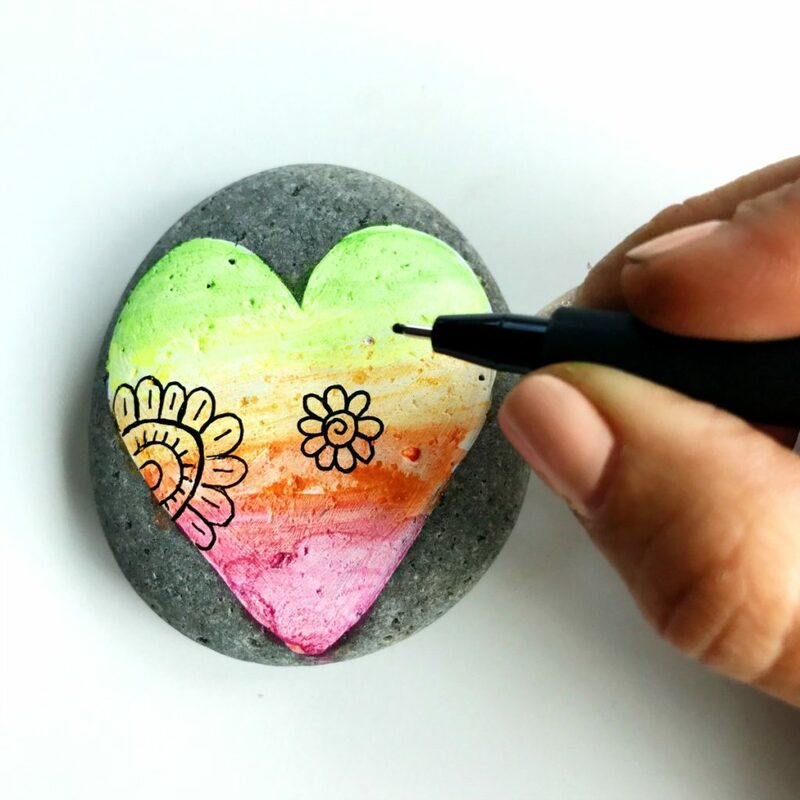 Have you decided which rock painting idea you want to try first? I’d love to see what you create. 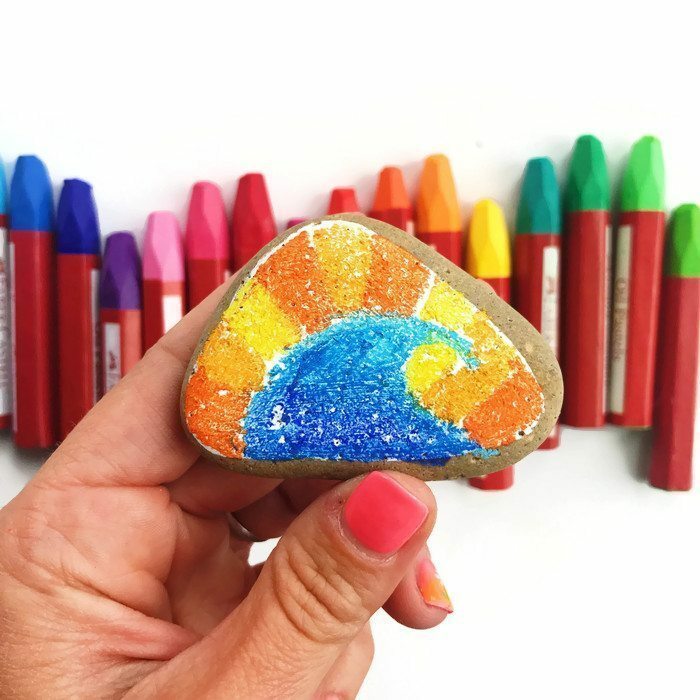 If you’re on Instagram be sure to tag your rock painting creations with @colormadehappy and @fabercastellusa.